Laurie Berglie, Alli Addison, Lindsay Brock, Julie Unger, Catie Staszak, Claiborne & Lime, Heather Buchanan, Terri Roberson Psy.D., Dr. Carrie Wicks, Ph.D.
Emily Pollard uses her BA in English from Saint Mary’s College of California to teach, write, and edit. She has worked in the equestrian industry for the majority of her life, as a groom, assistant trainer, barn manager, and everything in between. She trained and competed her horse, Skyler Ace, to the FEI level. She now enjoys sharing her passion for horses with her husband and two young daughters. Danielle Demers lives in New England with her husband and baby boy. A lifelong equestrian, she has always been inspired by horses. After graduating with a BFA in Painting, she worked to find a way to combine her passions for art, design, and the equestrian lifestyle. Through her work with EqSol, and as H&S’s Art Director, her interests have been melded together more perfectly than she could have imagined. Laurie Berglie lives in the Maryland countryside where she enjoys renovating her fixer-upper farm, reading horse books, and competing in the hunters. Laurie is also an author of equestrian fiction and maintains her lifestyle blog and Instagram, “Maryland Equestrian.” She has a BA in English from Stevenson University and an MA in Humanities from Towson University. Alli was born, raised and still lives on a ranch that has been in her family since 1837, located north of Santa Barbara, CA. Alli holds a BS and MS in Business Marketing from California Polytechnic State University. A lifelong equestrian, she has a passion for riding hunter/jumpers, loves art and the equestrian lifestyle. Alli also enjoys spending time with her husband and children. An avid former foxhunter, Pam knows well that special bond between horse and rider. With her husband she was co-owner of Dunford Farm, a Thoroughbred farm in Lexington, Kentucky, where she was involved in every aspect of the horses’ lives. Her journey with horses continues as a member of the EqSol Team. Heather Buchanan’s love affair with horses began with an aptly named pony Aphrodite. Heather combined her passion for horses with experience in luxury marketing and writing to become Editor in Chief of Equestrio Magazine then Editor of Puissance America Magazine. She worked with Equestrian Sport Productions to create some of the most talked about equestrian videos and now works as a freelance writer, consultant and editor. Lindsay Brock is a writer, photographer, and social media guru from Saugerties, NY. A Houghton College graduate, Lindsay studied Writing and Communications, while riding on the hunter/jumper and eventing teams. Lindsay is a full-time staffer at Jump Media, LLC. When not at a horse show, behind a camera lens or fervently Instagramming, you can find her astride her Zangersheide gelding, Justice Z. A licensed clinical psychologist, Terri Roberson combines her passion for horses with her clinical work in equine-assisted psychotherapy. She currently sits on the board of Giant Steps Therapeutic Equestrian Center. Over 25 years on the show circuit has given her an eye for equestrian style and provides constant inspiration for her frequent contributions to H&S. Laura Mormann and Antoinette Watson turned their love of entertaining and hospitality into an art form when they founded Claiborne & Lime. Catering to both lifestyle brands and private clients, they specialize in designing intimate, thoughtful gatherings and celebrations. C&L provides peace of mind, allowing clients to be fully present and enjoy their precious downtime with loved ones. Julie Unger has been writing and editing for various publications for the last decade, including covering show jumping and polo events. She has lived in South Florida, New England and many places in between. She uses her MA in Mass Communication from the University of Florida to continue editing, writing and utilizing her communication skills at Sirota Public Relations. Her work can be found at julieunger.com. A former three-day event rider, Ashley’s love of horses runs deep. Her photography has taken her around the world and her images have been exhibited in New York City galleries and major magazines. When she is not behind the lens, Ashley can be found riding her new Thoroughbred gelding and enjoying the outdoors. Queen B’s lyrics ring true, and I have learned in the past eight years since starting Horse & Style, they especially ring true for the equestrian industry. The majority of equestrian companies are women owned and led, so it was no surprise when Jennifer Wood, a female entrepreneur and trailblazer in the equestrian PR and marketing space, came up with the idea for the Equestrian Businesswomen Summit. When Jen called me and asked if I would speak on the Balance Panel, I felt honored and immediately said yes. So, I traveled to Florida and spent the weekend connecting with smart, sophisticated, and savvy women. It was remarkable to hear the other women tell their stories of triumphs and tribulations, and I enjoyed sharing my own story. I left incredibly inspired and I am grateful for the opportunities I have been presented thanks to my participation in the Summit. Read more on page 62. Last October I traveled to provide media coverage to two amazing competitions. One was in Rabat, for the second leg of the Moroccan Royal Tour (MRT), and one was in Verona, Italy for Jumping Verona. Just two weeks apart from each other, I quickly transitioned from one amazing culture to another. Read more about the MRT and my obsession with medina shopping on page 40 and learn about the 120th Anniversary of the Fiera Cavalli and Jumping Verona on page 90.
the US name, but in Europe, the trio operates simply as Global Partners. The Partners love their “transparent” reputation. They grant client access to all veterinary and performance records on the horses they sell. Lauren Kardel, the US lead, previously lived in California. Though Gilmartin and Dawson-Stanley are Irish, they are both fluent in Dutch. Since forming in 2018, Kardel Global Partners’ horses have won over 100 Championships. There are numerous agents who can help in the process of importing a horse. However, the who is not as important as the how. Kardel Global Partners has created a simple and transparent process for sourcing, acquiring, and delivering Hunter, Jumper, and Equitation horses for amateurs and professionals in the United States. They offer an informative and enjoyable experience, so each new horse owner feels confident in their equine investment. Global Partners has the right combination of relevant experience and a far-reaching network. All three partners – James Gilmartin, Kiefer Dawson-Stanley and Lauren Kardel – reside in Europe, and constantly connect with trainers and sellers to discover the most suitable partners for their clients. They understand the nature of the US riding world – what the expectations are of the horse – and possess the skills and sensibilities to recognize appropriate and desirable horses for US riders. The Partners have relationships with providers at every point in the journey, delivering clients a single, seamless purchasing process. for Dutch breeder Egbert Schep, and won competitions throughout the country, from Lanaken to S’Hertogenbosch. Dawson-Stanley grew up riding for VDL Stud. With them, he was Dutch Champion for 4-year-old horses. Kardel spent two years with EuroHorse and Axel Verlooy, and five years as the American agent for Duffy Sporthorses. The Partners also have a program for training green horses before they come to America, and a program that allows Americans to invest in sales horses in Europe. Kardel’s first horse was an Arabian called Skandalous – they even learned to jump together. Luckily, Kardel survived to join the Partners! In the Middle Are the Horsemen T I K M AY N A R D 392 pages horseandriderbooks.com Paperback: $24.95 Have you ever wondered what it would be like to be a working student? To willingly trade labor for hands-on education with some of the most renowned riders in the world? In 2008, that’s exactly what Tik Maynard decided to do. At the age of 26, Maynard, a pentathlete, had just suffered a career-ending injury and was ready to change direction. The son of prominent Canadian equestrians, horses were in Maynard’s blood, so he set his sights on this fast-paced industry. His plan of spending one year as a working student quickly turned into three, and we travel with Maynard as he works for some of the sport’s greatest: Anne Kursinski, Johann Hinneman, Ingrid Klimke, David and Karen O’Connor, Bruce Logan, and Ian Millar. Show jumping, dressage, eventing, and even western, Maynard tries his hand at them all – all while trying to figure out where he fits. All professionals have their own way of doing things, their own training methods, their own foundations on which their businesses are built. This is eye-opening for Maynard who then realizes that there is not one right or wrong way to train and ride a horse. From that point on, he develops his own techniques, perfecting his methods one horse at a time. “Now when I imagined a dream stable, it was not one with a dozen Olympic horses, it was one where everybody liked each other. It was a place where every day we worked toward a common goal. It was a place with more work than gossip. It was a place where I would continue to learn about horse behavior. A place where I could practice with rope halters, teach horses to jump on-line, and have them work around me at liberty.” Throughout his memoir, Maynard is hired and fired and worked to the bone. But despite the long days and early mornings, the challenging horses and the harsh words from trainers, Maynard continues to put the horse first, always. This is a story about changing direction, staying focused, and adapting to life’s curve balls until all that hard work finally pays off. You can purchase In the Middle Are the Horsemen from Trafalgar Square Books at horseandriderbooks.com, and you can learn more about the author at tikmaynard.com. Bringing you #timeless-interiors that enhance the #equestrian-lifestyle of horse lovers and their #extended-families. No matter where you live, our sought-after #west-palm-beach studio & boutique is right in stride with original #collected-not-decorated ideas for making your home, office or stable facility #uniquely-yours. Call us for a #complimentary-consultation to discover why our #custom-designs are so widely recognized in the equestrian community and why you and yours will #love-to-live in them. quiz “I started Equine Elixirs and developed the digestive health supplement Ulceraser in an effort to solve a problem with my own horse, and it ended up turning into a successful business supported by some of the top names in the horse show world. I started riding seriously again after I established my legal career, and bought Bella when I was ready to own a horse and show again. After a few stressful changes, my formerly not-spooky horse started spooking. She pinned her ears during grooming. She was sulky to leg pressure while riding.They were all classic signs of ulcers. Studies show that up to 90 percent of performance horses have ulcers. Ulcers can lead to symptoms like irritability, anxiousness, resistance to leg, poor appetite and weight loss, dull coat, spookiness, poor performance, and mild colic and colic-like symptoms. Stress (caused by training, competition, shipping, or injury), the use of non-steroidal anti-inflammatory drugs, limited access to grazing, infrequent feedings, and large grain meals can cause the formation of ulcers. Thank you to Ben Hey, Sasha Kollman, Hannah Selleck, Philip Cillis, Shannon Beck, and new owner Michelle Filanc for this great team effort. Arena Construction. Geotextile Arena Footings. Subterranean Irrigation System. traditional riding . progressive teaching . proven results Welcome to our new clients joining the VL leasing program this season! Want a chance to be our Ultimate Horse Health Challenge winner? Boost your equine IQ, beat the quizzes to unlock exclusive offers, and then enter for a chance to take home a seriously awesome prize package! 6. Forever And Ever strikes a pose by the hunter ring 7. Kiera Phlipot poses with her two unicorns 8. Magical Diamond and Addison Stoughton ride a stellar round in the Medium Pony division 9. Iconic and Julia Furst jump around the Roberts Ring 10. WEC exhibitors always make time for a little fun between rounds! 11. Great rides deserve big hugs 12. Carlotta W and Stacy Ryback take home the blue! efore devoting herself to real estate, Martha Jolicoeur first made a name for herself among the equestrian community as a top amateur show jumping athlete. Having trained with several North American legends of horse sport, she is now Wellington’s go-to broker for residential and equestrian properties. Jolicoeur may have hung up her show coat, but she is still a familiar face, industry supporter, and event sponsor in the equestrian world from Wellington, FL, to Canada. For Martha, real estate is now her sport, and she’s winning! started training with 10-time Canadian Olympian Ian Millar. He really encouraged me to step out of my comfort zone. He told me that I knew exactly what I needed to do to ride jumpers successfully, but I was afraid. I had been doing the amateur jumpers with George, but Ian made me competitive on a variety of horses and he found a horse for me named Sweet Lullaby that I ended up buying from Belgium’s François Mathy. Ian first saw her in Switzerland in a little town between Geneva and Zurich, and she was definitely the best horse I ever had. The other person who influenced my riding was Norman Dello Joio. After I graduated from college, I moved to New York City and began riding with him. He taught me that I was capable of jumping even bigger and going even faster. He put the finishing touches on my riding to complete the package. Under his direction, I was named American Grand Prix Association (AGA) Rookie of the Year in 1985.
are coming to Wellington today than in 2005 because of the growth of the horse sport industry itself. Growth has been the biggest facilitator for a healthy market in Wellington. Before, people were renting more than buying, but today more people are buying because they realize the horse show is here to stay and they spend more nights of the year in Florida than any other location in the world. I would say that the great majority of equestrians have someplace to call home in Wellington. H&S: What inspired you to create the Martha Jolicoeur Leading Lady Rider Award? MJ: When I was competing, my favorite award to win was most definitely the Leading Lady Rider Award in a sport that makes no distinction between male and female athletes. It was a sign that I was consistently successful. That inspired me to dedicate a portion of my support of events like WEF and the Upperville Colt & Horse Show in Upperville,VA, to showcasing women who strive for and achieve success. I have now been presenting the award at WEF for nine consecutive seasons. H&S: Will we see you back in the competition ring anytime soon? MJ: I never stopped riding from the juniors all the way to the grand prix level. Horses are still my passion, but for now real estate is my competitive sport. Although, I have been working on my golf and tennis games lately! HYGAIN® is the leading equine feed and supplement company devoted to bringing our customers closer to their dream by blending years of experience, innovation, up-to-date research and enthusiasm to nurture the best qualities in horses. As an equine only feed mill and manufacturing facility HYGAIN® is dedicated to equines and their special requirements, resulting in outstanding nutritional solutions that really make a difference to your horse’s health, performance and well-being. Yes! The New Year has arrived and we firmly believe that 2019 is going to kick you-know-what. Push aside the concept of human-created time and the fact that resolutions are more like casual promises with no legal obligations whatsoever. We still love a good old-fashioned New Year and all the newness it brings. And remember, we are one year away from the roaring 20s, which means that 2019 is more like the pre-party to what will be an epic decade. So what is on our radar in these early months of 2019? We’ve been pining over taking care of our bodies, taking care of our minds, trying something new, and have become full-blown-believers in treatin’ yo-self! But, let’s face it, we’ve always been believers in that last one. Charming As the winter months fade into spring, our wardrobes transition from blacks and greys to brighter hues and more colorful tones, uplifting both our attire and souls. And while basics are everything, adding a neutral print to an otherwise mono-tone ensemble creates the perfect pairing of bold and basic. So this season there is no need for a handsome suitor to save your spirits, simply let your prints do the charming. Moroccan Royal Tour Last October I traveled to Rabat, the capital of Morocco, to attend one leg of the Moroccan Royal Tour (MRT), and the trip was incredible from the beginning to the end. It was exciting to visit a country in Africa; the people were warm and friendly, and the MRT proved to be an excellent show jumping competition. I encourage any equestrian enthusiast looking for a unique vacation destination to put Morocco and the MRT on their list – it does not disappoint! to compete in a World Championship. His successes continued two years later, when he went on to compete for Morocco in the 2016 Summer Olympics. The now 57-year-old rider is the crown jewel of Moroccan equestrians, and is adored by the crowd. Though I have seen Ouaddar ride in other competitions, it was great to see him show in Morocco, and get to be a part of the collective energy that loves him. When Ouaddar entered the ring, the stands fell silent, as everyone hoped for (and expected!) an excellent round. If his horse had a slight rub on a fence, or if he missed a stride, the crowd collectively gasped. And when Ouaddar went clean, he got a cheering crowd and a standing ovation. When Ouaddar shows, it is hard to say who has more fun: the rider or the fans! A SWISS VICTORY After several days of exciting show jumping competition, the final day in Rabat culminated in a Nations Cup. Eight teams made the trip to this leg of the Moroccan Tour to compete: The Netherlands, Belgium, United Kingdom, Italy, Switzerland, Saudi Arabia, France, and the crowd favorite of course, Morocco. It was an incredible line-up. After two rounds of great show jumping, it was the Swiss team, led by Swiss Chef d’Equipe Andy Kistler, that ended up victorious. With three up-and-coming Swiss riders,Yannick Jorand, Pauline Zoller, and Elian Baumann, as well as the legend himself Pius Schwizer, riding exceptionally well, the Swiss team came out strong and secured their spot on top of the podium. Kistler was happy with his team, and happy with RBT. He explains: “Rabat is a wonderful competition and we are always well welcomed. I could compose a team mixed with young riders in need [of] experience and others [that are] more accomplished. The scores were tight after the first round, and I asked my team members to focus on their riding. I really wanted them to enjoy their time in the arena.” Even though the Moroccan team did not win, it is always great to have excellent rides all-around and a gracious winner. G O O D BY E . . . B U T N OT F O R LO N G I cannot say enough wonderful things about my Moroccan adventure. And while I wish I could have visited all three stops on the MRT, I now have two very good reasons to go back to Morocco. I look forward to going back to see more spectacular show jumping, immersing myself in the culture again, and buying the rest of my poufs. 5. 1. The Moroccan Royal Tour (MRT) presents a luxurious cooler to the winner 2. An enthusiastic Swiss entourage help the Swiss claim a Nations Cup victory 3. The anchor of the Swiss team, Pius Schwizer 4. You can see the Moroccan pride during The Nations Cup! 5. A local Moroccan horse is happy to have the busy MRT show on the grounds 6. The jumps are almost as beautiful as the horses! Mind, Body, Soul … Sip, Snack, Squat 1. M I N D My go-to podcast is “This American Life” on NPR. Each episode is a true story based on a theme that relates to American culture. The radio producers are witty, thought provoking, and truly passionate about documenting real stories about life in America. The podcast has gotten me through early mornings and long car rides to and from horse shows. The series has been on air since the 90s, so if you are a new listener, you have decades of fantastic archived radio stories ahead. 2. BODY As I approach my late 30s, skin care has become more important in my daily body care routine. I am quickly becoming obsessed with La Mer eye cream. It is practically a small paycheck in a bottle, but it is worth every wrinkle-free-penny. I also love the artisanal body scrubs from Therapy Corner, in which three natural products are infused with essential oils. These scrubs make showering off horse show grime enjoyable. 3. SOUL For me, friendship is good for the soul. I love my family and spending time watching my girls grow, but every now and then, I need a little break. Even if it’s a quick walk, an uninterrupted phone call, or a girls’ weekend away, time with my friends is time I treasure. Most of my really great friends are involved in the equestrian world, and those friends usually make great travel buddies because they will fly all over the world with me to watch show jumping! 4. SIP Rosé All Day! It’s as cliche as it is true, but winter, spring, summer or fall, rosé continues to be my staple. My favorite is Chateau d’Esclans Whispering Angel. Produced in France, the pretty in pink wine is crisp, fruity, and dry. Nothing tastes better than a glass of rosé at the end of a long horse show day. 5. SNAC K In 2019, if you are not having some sort of grocery item delivered, you might be living under a rock. Groceries, veggies, meat, meal kits, you name it, it can show up on your doorstep with the click of a button. I am an avid Amazon Prime user, and recently started using Prime Fresh. However, I am officially obsessed with Imperfect Produce. The fruit and vegetable delivery service provides produce that would normally be discarded because it does not meet grocery store standards. We are several boxes in and have been pleasantly surprised with each box. Sign up and get ready to get your veggie on! 6 . S Q UAT I have a love/hate relationship with the gym, but when I stopped riding ten horses a day, I found I needed more exercise. Two kids later, I’m still working on finding balance and carving out space in my day for a work-out. I have settled on trying to do something every day, even if all I can do is squeeze in a walk while I head to pick up my kids from school. However, I did recently discover CB FIT Pilate studio. Each group Pilate session is a 45-minute workout that is high intensity and low impact. It has been a great addition to my weekly routine. e drew inspiration for our spring brunch look from one of our favorite wineries, Promontory Wine in Napa Valley. Drawing from the rustic, modern aesthetic, we selected a color palette of black and ivory with pops of emerald. The quilted linens added a luxurious texture and warmth, while the stripes kept it feeling approachable and appropriate for an outdoor setting. Green glassware added an unexpected vintage touch, while the gold flatware and black frayed linen napkins added polish and kept the look modern.We added clusters of posies tied with leather string at each place setting, which served double duty as both a placecard and sweet takeaway for each guest. Naturally, we kicked things off with wine flights paired with beautiful platters of fruit, cheese, and charcuterie, followed by a delicious spread of gruyere and asparagus quiches, a spring salad of pink grapefruit and avocado, and crab, spinach and mushroom tarts. No gathering is complete without dessert, and we finished ours off with an unforgettable trio of vanilla bean, chocolate, and honey lavender creme brulees. We’ve rounded up all the essentials, from what to wear to the items you’ll need on hand to host your own alfresco spring soiree. This article is supposed to be a “Barn Envy,” but for Willow Creek Estancia, this story should really be renamed “Estate Envy.” Willow Creek Estancia is so much more than a barn – though its two barns are exceptional. It is an incredible property with a rich history that offers an unparalleled way of life. INSPIRED BY ARGENTIN A The story of Willow Creek Estancia began when the owners traveled to Argentina and were completely taken by the architectural details and spacious style of the local ranches. They also fell in love with the ranching lifestyle, and felt drawn to spend more time at home, with family, and on their own land. They returned to the United States dedicated to creating a homestead that would give them the feel of those Argentinian ranches. For the location, they decided on Rancho Santa Fe, a community in San Diego County, California. The proximity to excellent schools, the beach, great golf courses, Del Mar Racetrack, and several metropolitan southern California cities made it an easy choice. Fortunately, the family was able to purchase the Willow Creek Ranch property, a large property that already had an equestrian facility, several desirable amenities, and the acreage that would allow them to take the estate to the next level. To help them realize their dream, the family enlisted the help of prominent Santa Monica and Santa Barbara architect Marc Appleton of Appleton Partners. Appleton jumped at the chance to develop Willow Creek Ranch with the family, as he shared with them the nostalgia of growing up on ranches in the Midwest. Drawing upon that life experience, as well as his professional experience creating modern architecture with features that pay homage to the past, Appleton worked to transform the wonderful property into an incredible family estate. a farrier workspace. With that level of extravagance, the family admits, it is never hard to get a farrier out to tack a shoe back on! The Main Barn is also a luxurious space for equestrians. A private lounge acts as a place to wind down after a ride. A full kitchen allows for healthy eating during long days at the barn, and a conference room and four office suites allow trainers and owners to conduct business in a professional space.The Main Barn also provides staff with wonderful accommodations including a trainer’s apartment with ample space, as well as four additional apartments for other employees.The Main Barn is set up to house an elite equestrian training program and all the people that come with it. In addition to the wonderful Main Barn, the family also built a private seven-stall barn for their own horses after purchasing additional parcels of land throughout the years. Located just a few steps from their home, the Family Barn features clerestory windows that allow the California sunlight to stream in, high wood ceilings with open beams that create excellent airflow, and large stalls with sizeable paddocks that encourage in-and-out living.The family also had a one-bedroom apartment built adjacent to the barn for the groom’s living quarters to ensure that their horses are always well cared for and carefully monitored.This living area has a kitchen, bathroom, living room, and secluded outdoor terrace. Both the Family Barn and the groom's apartment match the Santa Barbara style of the Main Home, perfectly fitting the aesthetic of the estate. The best part of the estate is that at Willow Creek Estancia, the riding opportunities are endless! The property sits on 77 flat acres that make trail rides, exploring, and leisurely rides a pleasure, whether you stay on the estate or venture off to hit the coast to crest trail. It is located within the Rancho Santa Fe Covenant, which allows access to 68 acres of designated open space and 50 miles of groomed equestrian and hiking trails. For the competition minded, the property has three large sand arenas that are appropriate for any equestrian discipline. For the jumpers, it also has a grass grand prix field surrounded by mature trees and a hacking trail – it would be impossible to visit Willow Creek Estancia for a ride and not break out your studs. The family delights in having designed Willow Creek Estancia to be a facility for the competitive equestrian, as well as for the horse lover who just enjoys a quiet hack. They have thoroughly enjoyed the best of both those equestrian worlds while living at the estate. It just doesn’t get more “Barn Envy”ish than that. BE THEIR GUEST It’s not always about the horses…right? Anyone? Anyone? Okay – though it is almost always about the horses, Willow Creek Estancia has some incredible amenities for the few times that it’s not. The family explains that when creating the Willow Creek Estancia activity areas, it was important that there be something to please each of their guests. For the athletically inclined, the property is home to three sports facilities and a tennis court with adjacent lounge. There is a sparkling pool and spa, which – thanks to the California weather – gets used almost year-round. For those wanting to clear their mind a bit, the property has a meditation loggia dedicated to quiet and solitude. The property is also home to a rose garden, conservatory, and raised herb beds, which please even the most discerning green thumb. One of the fun additions to the property is the construction of a Recreation Pavilion, where entertaining is the name of the game. Guests of all ages enjoy the special lounge where an arcade, gaming tables, and a two-lane bowling alley provide hours of fun. Great additions to the Recreation Pavilion are the adjacent private lawn and covered patio with fireplace that are large enough for a considerable gathering, as well as a catering kitchen and full-service bar which make hosting convenient. Through the years, the family has enjoyed hosting many celebrations and events at Willow Creek Estancia, allowing their guests to partake in the wonder of the estate. The family has hosted countless events that support charitable causes close to their heart. They are quick to reminisce about the countless birthday parties and family holidays that took place at the property, and they really cherish the memory of their daughter’s wedding that was held there. Willow Creek Estancia has played a large role in creating the type of life they have always dreamed of – one full of love, laughter, and good memories. THE NEXT CHAPTER While the family will always cherish their time spent at Willow Creek Estancia, ranching life is pulling them in a new direction:Wyoming. In order to ensure the property receives the care and attention it deserves, they have decided to offer it for sale.They hope that the new owners will cherish the property as they did, continue its story, and use Willow Creek Estancia to partake in life’s greatest joys: family, friends, and horses. M O R E I N F O R M AT I O N willowcreekestancia.com Pacific Sotheby’s International Real Estate Cathy Gilchrist-Colmar, 858-775-6511 cathy@ranchosantafeca.com Patricia Kramer, 858-945-4595, patriciakramerpsir@gmail.com The Rancho Santa Fe Covenant: The Rancho Santa Fe Covenant includes 6,730 acres with 1,720 homes patrolled by full-time private security.The town center is home to several high-end shops and restaurants. Covenant homeowners enjoy a social membership to the Rancho Santa Fe Golf Club with access to the clubhouse for events and dining. irsts can be both exciting and terrifying. But if you create something new that hits a responsive chord, the risk is worth it. The sold-out, first annual Equestrian Businesswomen’s (EQBW) Summit held on January 9th in West Palm Beach, Florida, is a case in point. What started as a casual gathering in January 2018 in Wellington, Florida, of a few women in the equestrian world, grew wings to become an inspirational day of learning, networking and sharing. Founder Jennifer Wood, of Jennifer Wood Media, Inc. and Jump Media, identified a need in the community to create an organization where women could come together outside the paddock, so to speak. Her goal was to put on an event that would bring like-minded entrepreneurs together for camaraderie, support, and networking. Women dominate the equestrian industry, but Wood felt there was a missed opportunity for them to learn from one another and network across the different disciplines. She also felt there was opportunity in tapping into a group of successful women who simply had a passion for horses. The more than 175 attendees spanned a quite diverse equine universe, but unique to the space was the common denominator, the horse. This heart connection played out throughout the day from stories of time at the barn bringing a peaceful moment, to a horse literally giving someone the will to live. Lavalette in turn reached out to other riders facing disabilities to encourage them to find a renewed life in the saddle. The panel on how to balance work, life, and horses featured Sarah Appel of Horse & Style Magazine, Lisa Davis Engel of A Wynning Advantage and Sidelines Magazine, Mandy McCutcheon of Tom McCutcheon Reining Horses, and Elaine Cordia van Reesema of Hylofit and was moderated by certified life coach Julie Saillant of Motivation-Addict. com. In a room full of Type A/I’ll sleep when I’m dead/coffee is indeed a food group women, this was a topic of much interest. Cautionary tales abounded of sacrificing for success: working on holidays, skipping selfcare, and missing out on quality time with family and friends.With this in mind, the panelists offered suggestions such as finding a mentor and hiring out some of the workload. The jobs panel focused on how to find a career in horses (that was not riding or training). The diversity of the audience was case in point for all the tangential industries surrounding the equestrian world. The panel consisted of Donna Barton Brothers of Starlight Racing and NBC Sports, Nicole Lakin of BarnManager, Janus Marquis, an equine physiotherapist, and Dr. Torri Maxwell of Dechra Veterinary Products. Each recounted stories of a pivotal moment in their careers, whether it was being a jockey to using the knowledge of the racing industry to be a broadcaster, to seeing a need in barn management that a new technology could fill, to using hands-on veterinary experience to represent helpful products. What was striking was the generosity of spirit of women willing to help other women looking for a new career path. when you can begin a breeding program here in the States? They recommended identifying a need in the marketplace and being ready to scale it with success. And lest anyone think equestrian business is a niche industry, Alexa Anthony of StableGuard presented original market research showing the metrics of a billiondollar industry. Jennifer Wood also spoke about her inspiration for founding Equestrian Businesswomen and helping women convert their passion for horses into fulfilling and enjoyable careers. We are so happy she did not have to fall back on a bartending career! She emphasized that again, without the help of her fellow women and sponsors, she would never have been able to bring the idea of a summit to fruition. And as any event producer knows, it pretty much all comes down to who will stuff the goody bags. Lakin, while also a panelist, was there for the entire day of the Summit as an attendee as well. “I was blown away by just how inspiring so many of the speakers were,” she said. “Everyone had something valuable to give and everyone wanted to learn. I walked away feeling the excitement of being part of a community, and I learned new things and met great people.The excitement and connections are still going – it hasn’t fizzled yet.” For those who were not able to attend the conference, the 2019 EQBW Summit is offering a digital ticket to see video of the conference, plus bonus interviews.The digital ticket can be purchased at eqbusinesswomen.com. EQBW plans to launch a year-round membership program in Spring 2019. JUMPER EVENTS, CHAMPIONSHIPS & FINALS 5 FEI Events - Bronze, Silver and Gold Tours, from 1.35m - 1.50m 1.50m Grand Prix classes Zone 10 NAJYRC Selection Trials NAL West Coast Finals - 3 divisions Show Jumping Hall Of Fame Jr/AO Jumper Finals West - moves outdoors to SJC! AON/USHJA National Championships * - returns to Vegas! SHOWCATION THE PLACE TO JUMP HUNTER EVENTS & SERIES Brookway Stables Young Hunter Series & Championships - FREE entries, discounted stalls 3 USHJA WCHR Weeks SmartPak Grand Hunter & High Score Awards 5 USHJA National Hunter Derbies 3 USHJA International Hunter Derbies 3 USHJA Pony Hunter Derbies USHJA WCHR Hunter Spectacular West Coast Amateur Owner Hunter Challenge - NEW in 2019! HUNTER CHAMPIONSHIPS & FINALS West Coast Pony Hunter Challenge USHJA Pony Hunter Derby West Coast Championships - NEW in 2019! CPHA Green Hunter 3’ & 3’3” Incentive Finals - plus qualifiers USHJA Green Hunter Incentive SW Regional Championships - plus qualifiers NAL West Coast Finals - 2 divisions Sallie B. Wheeler Hunter Breeding Championships AON/USHJA National Championships * - returns to Vegas! Timing is everything. For Cathleen Driscoll, timing was the constant theme of her journey to winning the 2018 Lindsay Maxwell Charitable Fund/United States Hunter Jumper Association Emerging Athletes Program (EAP). “I finally felt like I actually was in a situation where I had a horse I could take; and I was ready,” Driscoll said. She was. And so was Enzo, a nine-year-old Dutch gelding that has been her partner for just over a year. The only problem? She didn’t have a horse capable of participating, lacked the connections to help her get a horse to take part in the EAP, and was stuck on the sidelines. When she wasn’t working as a groom, Driscoll and Enzo trained tirelessly at Driscoll’s parents’ farm in Elk Mills, Maryland, while also fitting in about a dozen competitions a year in order to learn and improve along the way. But this year things turned around. Driscoll had the mount and, with the age increase to 25, it looked like the stars were aligning for her to participate in the 10th anniversary of the EAP. and the trainer is involved in all the oversight of that horse,” Driscoll said. “I think this program really highlights that and it takes you back to the basics a little bit, just knowing what your horse eats:What do you feed it? What kind of grain does it get? What kind of hay does it get? Why does it get that?” EAP emphasizes the core basics of horsemanship, which also informs the clinic layout. The first part of the program revolves around regional clinics, where riders spend five days learning on and off their horses, riding, training and learning how to care for their horses. “It was a lot of information to absorb in a short amount of time,” Driscoll noted. “I really think I learned a lot over the five days.” Learning at an accelerated pace was part of what drew her to the program.The focus on the whole athlete, learning in the ring and out, learning to care for your own horse and understanding the principles of horsemanship are emphasized, as they should be. “I was holding my breath after the regional clinic,” Driscoll confided. “I was happy with my performance, but it wasn’t perfect.” She hoped to be included in the list of riders who would advance to the national session – only the top 16 would – and was elated when she found out the news. For Driscoll, horsemanship started when she turned five years old and began riding at a local barn until she was 12 years old, when she worked with a different trainer and then competed at small rated shows for the next few years. At 16 years old, she brought her horse home and started looking for another trainer. Months would go by, and though it was unexpected, Driscoll became her own trainer, watching videos online, attending the occasional clinic and pushing herself. Those evaluating riders at the regional level – Driscoll participated in Virginia – saw how her hard work was paying off, and she advanced to the National Training Session, which was hosted by the University of Findlay from November 8th to 11th in Findlay, Ohio. For the EAP finalists, it came down to how perfect they had made their practice. At the conclusion of the session, finalists are not only evaluated on their progress, but also on riding an unfamiliar horse in a Nations Cup-style competition. The 16 finalists rode two rounds on the final course, which was designed by Anthony D’Ambrosio. Driscoll and Cherney both received a spot at the 2019 USHJA Gold Star Clinic in the 1.10/1.15m section. Driscoll and Escada soared through and finished with two clean rounds. When four other outstanding finalists – Maura Cherny, Katie Pelzel, Alicia Weismann and Kiersti Wylie – were called back for a third round, Driscoll thought she hadn’t made it. But then, it was announced that the third round was actually for the Reserve Champion, which went to Cherny. Cherney had ridden Goldfish, owned by University of Findlay alumna Kiera Phlipot for the week, and then met and rode Waffle, owned by the University of Findlay. Driscoll was awarded first place. For his hard work, 10-year-old Dutch Warmblood gelding Goldfish was awarded the Lindsay Maxwell Charitable Fund/ USHJA Emerging Athletes Program Outstanding Horse Award. As overall winner, Driscoll also received a $3,000 grant for educational training, a pair of Parlanti International tall boots, and a trophy. ur ‘Horse & Style: Home’ column typically takes us inside some of the most enchanting houses where equestrian style and décor radiates through every room. 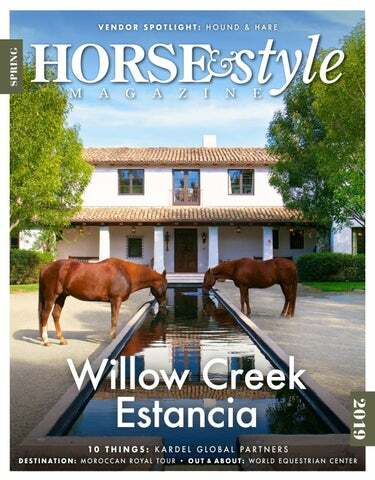 For this issue, however, we instead take you outdoors to get a glimpse of several stunning equestrian exterior projects. Joining us is Deborah Cerbone, design industry expert, who has recently added “equestrian landscape architect” to her resume. By combining her passions, she has become what she calls, “a problem solver.”When working on a new design project, she takes the needs of both horse and rider and combines everything to create an inviting space that is not only safe and functional, but beautiful. harsh winds in the winter. We also take into consideration sun orientation to capture natural light for the barn or solar power. Another consideration is the sunset views. We design the grading and drainage to direct the rainwater and run-off so we don’t end up with low spots and mud. Mud is every horse owner’s enemy, not only because it’s dirty and messy, but it can lead to injury from slipping, thrush, rain rot, scratches, cracked heels, etc. The placement of fences and gates are other important factors. We also design training areas, indoor and outdoor arenas, round pens, tracks, cross country jumps, etc., as well as plan for vehicular circulation for trailers, hay deliveries, fire trucks, parking for owners, guests and farm hands, and vet and farrier access. Other considerations are storage of hay, jumps, trailers, tractors and equipment, and attachments such as the mower, manure spreader, seeder, snow blower, etc. All these things need to be factored into the spatial requirements of the farm, and the functional relationships between each of these is measured in the design and placement of these features. our pre-engineered grading and drainage design. A land use attorney has guided us through the local zoning approvals and state environmental approvals. The house and four outbuildings are currently under construction and we’ve recently submitted for approvals of the stables, and indoor and outdoor arenas. 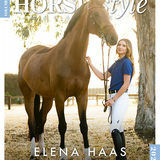 H&S: What trends are you seeing in equestrian design? DC: We find our residential equestrian clients also looking to have small farm animals like goats and sheep, mini horses and donkeys. They are often interested in raising chickens for eggs, fruit orchards, vegetable gardens, and sometimes beekeeping. We also see the desire to incorporate outdoor lounge or entertainment areas outside the stables for socializing. My favorite time of day is before sunset, when the sunlight casts a golden glow on our pastures. The sight of our horses grazing in our front field is magical. We like to plan an area on the farm where our clients can sit outside the barn to relax and enjoy those beautiful sunsets. H&S: You seem to genuinely enjoy what you’re doing.What makes the job fun? How does that reflect in your work? DC: I’m like a little kid the way that I love horses. I get so excited when I see one anywhere. It seems so silly for someone my age, but it’s true. I absolutely love being able to combine my passion for horses with my passion for design; it has added another level of challenge to my work. We’ve been designing beautiful properties for people for 27 years, but now we’ve added a new user of these properties – the horse. I wish I had thought of specializing in equestrian design years ago, but I guess I just wasn’t ready back then. It is very rewarding to see our clients get so excited over hearing our ideas and feeling that we really understand their equine challenges and have their needs and their horses’ health and safety first and foremost in our designs. I love when a client says, “What a great idea! I would have never thought of that!” Deborah and her team work with clients all over the United States to help them realize their horse farm dreams.They are a small, boutique-type landscape architecture group based in New Jersey with a satellite office at Deborah’s second home in Northwestern Montana. DONNA BERNSTEIN Why did Donna Bernstein become an equestrian artist? “Because horses exude the values I enjoy in life.” The simple joy horses find in everyday life combined with their beauty, oneness with nature, and ability to bring about the best in us is why she chose them as her muse. A horse-crazy girl grown up, Donna’s unique artistic perspective brings to life all the horses she’s ever loved. new horse book for me when it came in), their anatomy, illnesses and cures, and as I learned to ride, I created my drawings and paintings full of the vision, imagination, and love I already had for them. This has truly defined my signature artistic style. I realize now that I am painting those horses, the horses I never had. I was told once that horses chose me, and that my horses exist somewhere between heaven and earth. My horses are stylized and imaginative, abstract and sometimes whimsical, expressing the allencompassing energy of the horse, which is inspirational for me. Their joy for life, sense of companionship and family “herd” nature, with a willingness to work combined with beauty, sensuality, and freedom – they exude the values I enjoy in life. H&S: Did you ever doubt that you were meant to be an artist? H&S: Do you conceptualize your work first, or do you just start painting and see what emerges? DB: I was in business for many years, in both advertising and real estate. So, following my art as a full-time career is relatively new. I think doubts are common, but we just keep on keeping on, don’t we? When I create custom works for clients and am able to create for them exactly what they are looking for, or a person sees in my work their own horse or a dream one, that level of recognition is a tremendous high. It keeps me focused, knowing I truly have something special to offer. As I say, in my art it is not horses that I paint; I paint the way they make me feel – and everyone responds to that on some level. Art is all about how it makes you feel, for both the artist and the viewer. It is not horses that I paint; I paint the way they make me feel – and everyone responds to that on some level. somewhere into a piece. I don’t have to have the picture in front of me to recall it. H&S: What is your state of mind while you are painting? H&S: How long does it take to complete one painting? DB: Generally, quite concentrated! When I stop for a break, I realize that I am exhausted! DB: That truly varies because if I am working on a dripped piece I have to see the horse in its completion and keep it very minimalist and stop quickly – too much will destroy the aesthetic. On the other hand, if I am working on a layered piece I may have to wait for days until I can see how to proceed. Since I don’t do scenes or work from pictures, but am creating from an internal creative space not unlike abstract expressionism, it can be quite a demanding journey. H&S: Where do you currently reside? How does it influence your artistic style? H&S: What do you hope an audience will perceive when looking at your paintings? H&S: Is there a particular artist who has influenced your work? DB: I hope that they get a great feeling of what the horse offers and symbolizes for us, now and down through the centuries. The horse in many ways is still a mythological creature, with mystical power and inspiration. I hope to remind people through his form and grace, of those elements of themselves that are also mystical, inspired, and timeless. DB: I love when I see artwork that is fresh and original and powerful. In classical terms I love Rosa Bonheur, Degas, Franz Marc, Picasso, Frankenthaler, and O’Keefe. Of course, in equestrian terms I admire Alfred Munnings, Deborah Butterfield, and too many modern artists to name. Paul Brown is a favorite illustrator. DB: I split my time a bit between Arizona, Idaho, and New York – with more time going forward in New York, where I am from originally. In each place horses are popular and often different, which just reinforces what a powerful force they are for so many. Horses do everything we could ever ask of them. H&S: What inspires you? DB: Positivity, confidence, faith, a sense of accepting challenges and rising to the occasion. Prevailing and being your best self. Art teaches you about what you have to say and how you want to say it. I feel very lucky to be so profoundly connected to horses because they are a unique animal in their ability to mirror the spirit, reflect our imagination, and encourage action. H&S: What’s next on the horizon for you? DB: I am expanding the vision of my art into a variety of fashion items such as silk scarves, belts, socks, and fine jewelry. I see my art naturally created with a sense of design that translates into these other areas. My business sense and love of design keeps pushing me toward creating items that reflect my art in more ways so my aesthetic can be shared and appreciated. To learn more about Donna’s journey into the world of equestrian art and design, follow her on Instagram @dbartist and online at donnabernstein.com. Think Downton Abbey meets Lexington, Kentucky. The British countryside meets the Bluegrass. Tweeds and wellies and country attire but with a southern American twist. That’s Hound & Hare – two uniquely stylish worlds colliding to bring you the best of the sporting life. BLUEGRASS BRED & ENGLISH ENAMORED An·glo·phile – a noun. A person who is fond of or greatly admires England or Britain. his dreams of developing a company that would allow him to share his passion for quality accessories for the field and clothing that reflected the sporting life. Hound & Hare owner, Eric Nicholas, has always been an Anglophile. Born and raised in the bluegrass, Eric fondly remembers hunting with his father in the fields close to his old Kentucky home. It was then that he fell in love with the sporting life, spending his days out in the countryside, dad on one side, a beagle hound on the other. Unsurprisingly, the idyllic dreams dotted with hounds and hares followed young Eric into adulthood. who share a commitment for supreme quality and innovation. “A founder of one of the new luxury brands once told me that, ‘Britishness has a specific and recognizable feel and heritage, but trying to define it is extremely hard. It’s enigmatic but distinct.’ I found this to be exactly the case. Trying to translate countryside style to the U.S. proved to be elusive and difficult to define. As a result, we have made it our mission to redefine countryside chic and sporting clothing style by introducing new British luxury brands, as well as our own Heritage line, to the United States.” H E I R L O O M Q UA L I T Y P R O D U C T S Clothing and accessories that bridge country and city style have been said to be both classic and contemporary. “I think there is a rejection among many people today of fad fashion, and a strong desire for authentic pieces that can be defined as heirloom quality. Fiera Cavalli & Jumping Verona It’s no surprise Shakespeare set his tragic love story, Romeo & Juliet, in the city of Verona, Italy. Verona is on the Adige River and is the third largest city in Northern Italy. The complex blend of urban architecture and historic landmarks (such as my favorite, the Arena Di Verona which once sat 30,000 people and still holds concerts and events with up to 15,000 people), is what makes Verona feel so extraordinary. I traveled to Verona with my forever horse show partner in crime, my mom. As we sat jet-lagged in a café that overlooked the Arena Di Verona, drinking Aperol spritzes as we watched the sun go down, I knew our trip to Verona was going to be a wonderful experience. “Made in Italy” has merit that extends beyond the fashion industry. F I E R A C AVA L L I Horse & Style was invited to Italy to attend the Fiera Cavalli, a weeklong expo that celebrates everything equestrian. 2018 was the 120th anniversary of this extraordinairy event. The Fiera Cavalli has 12 exhibition halls, each displaying a different equestrian theme. There was a hall for equestrian tourism, a hall for Italian bred horses, a hall for western culture (which included daily line dancing), a hall for children, and many more. My favorite hall was the one that featured all the Italian equestrian brands, the Jumping Verona, and the CSI 5* competition that took place during the Fiera Cavalli. as always, was the free-rein performance.The connection between the human and horse without a bridle is always mesmerizing. JUMPING VERONA The top riders in the world showed up to compete in the FEI World Cup™ qualifier at Jumping Verona. The crowd was energetic and supportive, especially when the Italian riders entered the ring. When an Italian rider, like Eugenia Grimaldi, won a class, the crowd was on their feet, cheering as loud as they could during the awards ceremony. The crowd favorite, Lorenzo De Luca, has always been a favorite rider (and favorite person) of the whole team at Horse & Style. So it was great to be in Verona for his exhilarating win in the Safe Riding 1.45M CSI 5* aboard Evita van’t Zoggehof. I was able to say a personal hello to De Luca, which felt like a huge accomplishment of my own. There were so many adoring fans waiting patiently for autographs and selfies, it made saying hello to De Luca feel like trying to get backstage at a Justin Bieber concert. D E U S S E R ’ S DAY The excited crowd fueled the energy on the final day for the FEI World Cup™ qualifier class. With the top three riders from the World Equestrian Games, Simone Blum, Martin Fuchs, and Steve Guerdat, the crowd knew we were all in for some fantastic show jumping. And fantastic it was! 14 clean rounds made for an exciting jumpoff, and an incredibly thrilling end to the week. One by one each rider rode, some beating the time of the person before them, but like many classes before, it all came down to Deusser. And like many classes before, Deusser delivered. He and Calisto Blue topped the 14 horse jump-off with a blazing time of 35.83 seconds. While the crowd may have wanted an Italian to win that day, after the ride Deusser delivered, they all instantly became German fans. FA R E W E L L V E RO N A Even though Shakespeare’s love story ended tragically, our time in Verona was anything but tragic. In fact, it was magical. As an American, it never ceases to amaze me how you can be watching the top riders in the world compete at a 5* horse show, and an hour later be walking through some of the most historical monuments in that country’s history. I absolutely plan to come back to the Fiera Cavalli and Jumping Verona, to shop, watch the show, and for one more Aperol spritz! Earn Preferred Points every time you shop, for discounts toward merchandise. Visit our website and sign up now to earn 100 bonus points. you told me 10 years ago that I’d someday be writing a column for a magazine with the word “style” in its name, I would have never believed you. I started my own business, Catie Staszak Media, Inc. And I ride in whatever free time I can possibly find. When I was a little girl, I was the tomboy. You wouldn’t catch me dead in a dress. I lived in the barn (Well, that hasn’t changed much), and I cried when my mom signed me up for dance class and put me in a tu-tu. My grandmother wanted me to be a ballerina and a romance novelist. I ride horses and write about show jumping (and sometimes other sports). That’s kind of close, right? Through my various work endeavors and my involvement in many facets of the equestrian industry, I am constantly reminded what an important role style has in the sport of show jumping. Of course, I don’t just mean what breeches you’re wearing. class. I can’t ride without a hairnet, even if I’m on a trail ride, but my helmet does have my company logo on it. I believe in having a personal style, and as someone in media, I certainly recognize the importance of evolving with the societal landscape, but I also believe in celebrating our sport’s unique history. I may have grown out of the tomboy phase (Well, for the most part; consider this your warning if you challenge me in a sports debate! ), but thankfully, I never grew out of the horse phase. I’m fully immersed in my work and am so grateful to be able to combine my two greatest passions in horses and broadcast journalism into a career. Each issue, I’ll be checking in to share some of my observations on my travels and reflect on some sport media topics. If there’s one kind of style I’m most confident in, it’s writing style! I have a new horse and I am heading into the show ring after only two rides. How do I trust myself to connect properly with this mount so that we both feel safe, fluid, and receptive to our new partnership? Building trust with a new equine partner has a lot to do with the story that you tell about yourself as a rider and competitor. Every time you get on a horse it is as though it is the first time as both horse and rider are at least a bit different each day. Horses are prey in the wild, so they will come to the partnership with questions about their safety. It is up to the rider to dial into these questions and answer them sufficiently for the ride to go forward with ease and connection. During my own experience with this scenario I approached my first few experiences with my new partner in the show ring by being very clear about the track and cues I planned to use to show him the route. I had to bring a steady confidence to the warm up, rather than asking him questions as I had when I tried him. When we approached the show ring, I told him that the agreement we have is that I will be clear about the plan and he will execute, just as it had been in the warm up ring. When entering the ring, I told him where the first jump was and how we would be approaching it with words out loud! Since we were jumping a lower level than normal (1.10) the adrenaline that sometimes over-rides my focus in the higher levels did not overtake, and I was able to remain focused on each jump individually. I talked to him quite a bit as we went in order to be sure I was being clear with my messages. By the third round, I was able to trust myself to connect to this horse without quite so much overt action, but I remained clear that I needed to tell him what I expected each step of the way. In turn, he reciprocated with a kind confidence that left us both feeling inspired to do more together as our journey unfolds. If the connection with a new horse is a bit more challenging, I encourage you to take your time. Remember that the horse approaches this partnership from the perspective of prey and feels the need to keep its safety at the forefront. If you have not yet connected to your alpha rider self, the horse may pick up your concerns and confuse them as its own. Even if you are not feeling confident, remember that you have a brain that can create a narrative about what is happening and the words you use (even in your mind) will directly influence the dynamics of this partnership. So take some time to get clear about your leader-self by remembering how you have been a leader in other situations, and then bring this intentionality to your ride. It may seem abstract at first, but knowing this aspect of yourself will ultimately allow your equine-human relations to flourish. I am an amateur rider and I just moved up to the Low Jr/Am 1.30 jumpers. Even though I know my horse and I have the ability to jump this level, I have been experiencing extra adrenaline rushes before I show and while in the ring. This adrenaline causes me to get ahead of myself and make mistakes. What tools can I utilize to be able to use this extra energy in a positive manner? Becoming familiar with your own particular combination of energies is the key to staying present when the challenge and skill level of your riding increase. Begin by noticing the self-talk that percolates in your mind a few hours before your class, as well as the parts of your body that are activated. For me, my stomach develops butterflies and I remind myself that this is a message from my body that I will need extra energy and attention-oriented focus in order to complete the task at hand. These butterflies make it almost impossible for me to feel hungry or eat, so I need to be sure to nourish myself in spite of this chemical message. If I tell myself that I am nervous, a fear response follows, so I intentionally focus on using the butterflies as a trigger for confidence or at least clarity that I have what it takes to undertake this upcoming challenge. As far as channeling the adrenaline when in the ring, it is essential to use my breath while on course from the beginning to the end in order to keep my mind connected to my body. Additionally, the adrenaline surge can shift my focus from the jump I am approaching to either the entirety of the round I am conquering or to the jump ahead of me. My particular challenge is staying with one jump at a time and applying the element of the plan my trainer and I constructed to that particular moment. The larger challenge and potential fear response get me into prey mode, causing me to feel less confident. I would endeavor to stay in alpha mode in order to have access to my assertive and intentional power. Confidence and clear thinking allow me to focus on every single step and ultimately bring my mind peace and power. Therefore, the tools to focus on for new challenges are pre-game selftalk combined with awareness of the body part or area that is activated, breath throughout the round, and accessing the alpha/predator mindset that reminds me that I am in charge if I focus one step at a time. Dr. Carrie Wicks divides her time between her private sport psychology consulting and family therapy practice, traveling with athletes, and writing. She completed her doctorate in psychology while researching the mental practices of equestrian athletes. Her passions include horses, yoga, mountain biking, skiing, and time in nature with animals. If you would like to ask a question for this column or ask about a complimentary Performance Strategy session, please contact Carrie. Use HORSE5 for $5 OFF your first order! Always be competition ready with your Horse Show Emergency Kit! Each kit contains a hair net, safety pins, tweezers, blister pads and more! Available in five unique colors. A good equestrian knows that for every horse you must have at least 20 buckets – to carry everything from grain to water to manure.Well finally there is at least one bucket for us humans: the Roy Mini Bucket Bag by Chloé. And though this is bag is upscale enough for everyday wear, with its tanned leather, metal studs, and hardware finishes, it looks perfect with equestrian wear, too. So forget the hard plastic, get yourself a Chloé bucket, and carry on – in style.